Wat Phra Mahathat Woramahawihan is located on Ratchadamnoen Road in Tambon Nai Mueang. This is a royal temple of the first class. 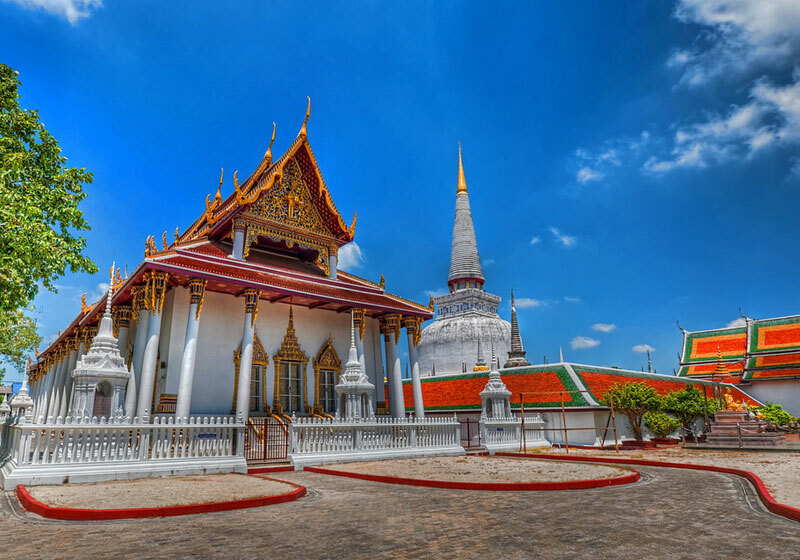 Formerly named Wat Phra Borom That, this is one of the most important historical sites in southern Thailand and in all of Thailand. According to the legend of Phra Borom That Nakhon Si Thammarat, Prince Thanakuman and Queen Hem Chala brought Buddha relics to Hat Sai Kaeo and built a small pagoda to mark the location. Later on, King Si-Thamma Sokarat established the city of Nakhon Si Thammarat and built a new pagoda. The present pagoda has a distinctive Sri Lankan style, measuring 55.78 metres high (measured by the Fine Arts Department during the renovation of the gold top in 1995). The height from the lotus base to the gold top is 6.80 metres. The top is entirely covered by pure gold. Inside the temple are many buildings of importance, especially the royal building which has beautiful architecture from the Ayutthaya period and the Sam Chom building where the Buddha image attired in royal wardrobe, Phra Si Thamma Sokarat , is housed. There are also the Phra Maha Phinetkrom (the equestrian image) building and the Thap Kaset building, while the Khian and Pho Lanka buildings are used to display artifacts that were donated to the temple by Buddhists. Short Description: Wat Phra Mahathat Woramahawihan is the main Buddhist temple (wat) of the Nakhon Si Thammarat Province in Southern Thailand. The main stupa of the temple called Phra Borommathat Chedi (Great Noble Relics Stupa) was built by King Sri Dhammasokaraja in early 13th century CE to establish a symbol for the Theravada Buddhism sect in the province. The temple is believed to house a tooth relic of Gautama Buddha.